Christian cemeteries in India, a legacy of the British empire, bear testimony to what John Donne, a 16th century metaphysical poet once described 'death' as the greatest leveller in his masterpiece Death, Be Not Proud. At these cemeteries, tactically raised in this part of the country, sleep side by side brave generals, resolute sergeants and anonymous commoners. Miles Irving, a reputed researcher on English memorials, says that the Christian tombs and monuments are posterior in terms of antiquity as compared to the Dutch and Portuguese inscriptions of the 16th and 17th centuries found in Madras and West Bengal. The British flag was hoisted across the Yamuna in the year 1803 and the Sutlej in 1846. George Thomas, an Irish sailor who reigned at Hansi, sleeps in peace at Berhampur in Bengal, whereas his stout lieutenant, Hopkins rests in an unidentified grave somewhere in Rohtak district. At Hansi lies a tomb venerating valiant Bernier who succumbed in the siege that dethroned George Thomas. The stone, however, does not mark his resting place as it was found in a tiny hamlet by a member of the Skinner family. Most famous of all, however, James Skinner, the propounder of Skinner's Horse, lies before the altar of the church he built in Delhi, and in the churchyard sleeps his chum, Willium Fraser who was killed in 1835. The earliest inscriptions at Delhi are those of Sergeant Walker (1808) and Major Eagle (1811). 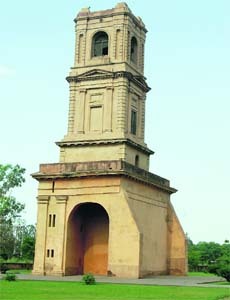 Older than these, however, is the tomb of Captain Bagshaw (1807) at Karnal, the garrison of which place had been strengthened the previous year in anticipation of an attack by Maharaja Ranjit Singh. The only traces of the Gurkha War are found in the monuments at Nahan in Himachal Pradesh, where four unnamed British officers fell in Jampta and Jaithak. Karnal was a large frontier cantonment from 1830 to 1844 when its insalubrious conditions forced the troops to move out to Ambala. The church there was pulled to be rebuilt at the new station, but its tower erected with public donation was left intact. The tablets decorating the church earlier were shifted inside the 100-feet high tower whose sparse shadow provides little succour to about 50 Englishmen resting in the nearby European Christian cemetery, a protected monument. Three graves on the banks of the Sutlej at Ludhiana in Punjab are a reminder of the disaster of 1846 when the barracks of the 50th Regiment crumbled, crushing several men, women and children to death. Soon thereafter, the town was discarded as a cantonment. Another old cantonment was that of Bharawas near Bawal, but in the absence of any epitaph, it is not possible to identify those resting there. 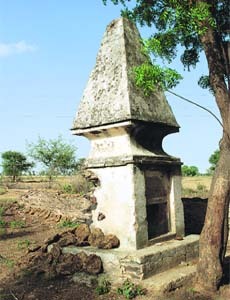 Some of the elderly inhabitants, whom this author met, amusingly recall even today the presence of a tomb raised in the memory of an English dog in Bharawas. Between Ferozepur and Ludhiana are large battlefields where witnessed four battles of the Sutlej campaign during 1845-46, Mudki and Ferozeshah near Ferozepur, Aliwal near Ludhiana and Sobraon, about 30 kilometres from Ferozepur. Various tablets have been raised in the Ferozepur church, enlisting those who were assassinated in these battles. The last battle of the First Sikh war drove the Sikhs from their entrenchment at Sobraon into the Sutlej. Sir Robert Dik, while commanding the British division, was killed in action and his body laid to rest in the Ferozepur cemetery. An eminent historian, Joseph Davy Cunningham, who wrote History of the Sikhs, was buried at Ambala in 1851. The period of tranquility between two Sikh wars is marked by the solitary grave of Major Troup at the frontier post of Mukerian, near Gurdaspur. There are no other monuments of notable relevance dating prior to the First War of Independence fought in 1857. The Punjab cemeteries bear grim witness, chiefly, of course, to those of Delhi where over 50 inscriptions commemorate the victims of massacre or those who fell in the fight for the city. A list of the actions of Delhi's siege and of the officers assassinated between May 30 and September 20, 1857, is engraved on the Mutiny Memorial, but it appears incomplete. It is headed by Nicholson who lies under a simple stone in the Kashmiri Gate cemetery close to Greathed, an agent of the Lieutenant-Governor. Next come Colonel Chester, his aide-de-camp Captain Russel and Captain Delamain, killed by the same cannon shot in Badli Ki Serai battle; all three buried in the Rajpura cemetery. At Karnal was laid to rest one General Anson, the Commander-in-Chief, who fell on his way to Delhi. His mortal remains were subsequently flown to England, and no monument marks the place where he took his sanctuary. Colonel Hallifax of the 75th Foot, who also died on his way to Delhi, lies in deep slumber there whereas Colonel Murrey Mackenzie, Lieutenant Edward Salwey and Colonel Garbett were rested at Shimla. In undivided Punjab, the first outbreak was the rising at Hisar, Hansi and Sirsa on May 29, commemorated in the monument at Hisar, and graves at Hansi and Sirsa. Another outbreak in Punjab was the rising of the turbulent cattle-lifting tribes of the Ravi in Montgomery, then the Gugera district. Henry Lawrence, one of the British heroes, was done to death while defending Lucknow, and whose memory has been kept alive by the Military School at Murree and by the Military Asylum which he founded at Sanawar. The Lawrence School at Sanawar has emerged as a model public school where the students wear a never-give-in attitude on their sleeve. Another event to which the Punjab cemeteries bear witness is the Ambala campaign of 1863. Most of the dead lie in the old cemetery at Mardan, but some are found at Nowshera and Peshawar. In the church of Palampur, destroyed thereafter by an earthquake, stood a tablet commemorating Sir Thomas Forsyth, who was Commissioner of Jalandhar and also served as Deputy Commissioner, Ambala during the Quit-India Movement.